For the second week of BM, i chose the theme : Dips/Spread/Chutneys. Originally i planned a strawberry and cream cheese dip, an easy one, no work at all. While getting the ingredients from the fridge, i noticed the cream cheese was very less 😞. I rememberd Usha's post of Roasted Strawberries, thank god for my memory, i made these. They saucy berries, are tasting so good, i couldn't stop eating these saucy berries and licking the juice clean off the spoon. Usha has clearly mentioned in her post, that there was too much liquid after roasting it, so i increased the temperature a bit and roasted them for 45 minutes. Even then there was liquid, but it was bit thick and saucy. Loving it every bit, can't wait to top it on my toasts tomorrow. Wash and hull the strawberries and chop them into 3 slices each. Spread the sliced strawberries on a baking pan. Add sugar, vanilla extract, ginger and chili powder. 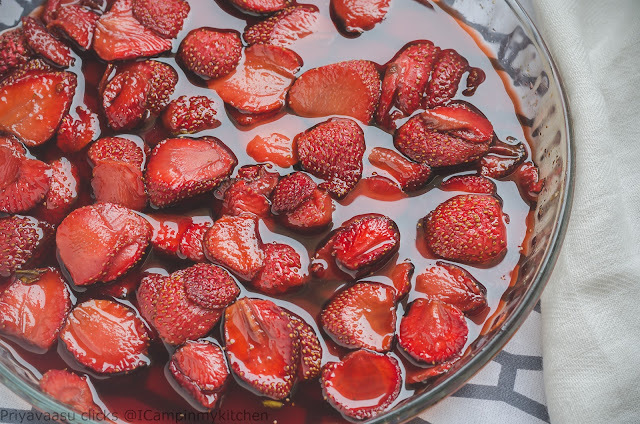 Use your hand and mix them well, so the strawberries are well coated with sugar and spice mix. 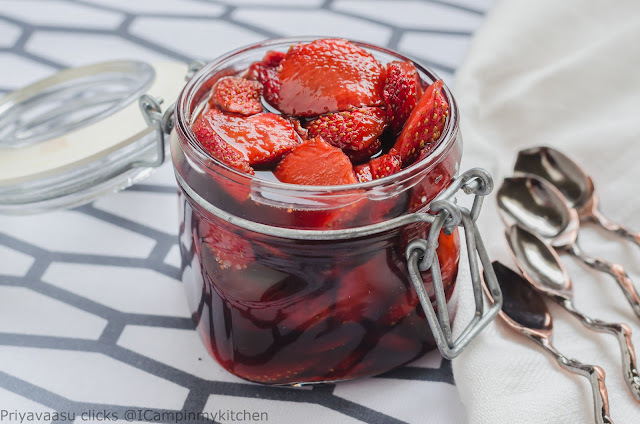 Preheat the oven to 200C and roast the strawberries for 40-45 minutes. Once done, remove them from the oven. let it cool. 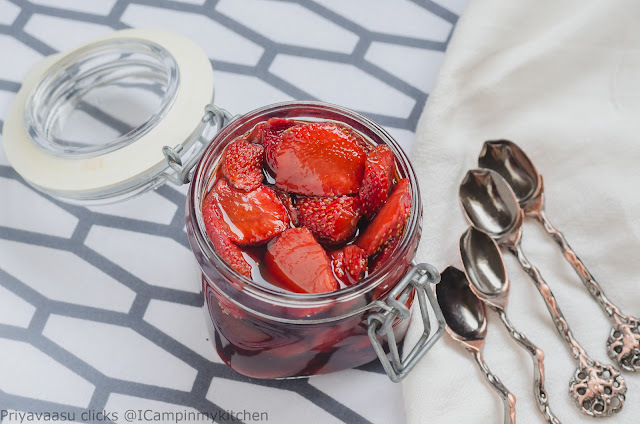 Transfer the contents to another air-tight jar and refrigerate it. Enjoy this spread on your toast or on your morning cereal,just add it to your yogurt tub and enjoy the goodness. Looks yummy and nice way to include strawberries in our diet..
Will wait for that toast Priya...the strawberries should last till you make na..Lol. What an incredible idea for a spread. The photos are so good Priya. Oh those roasted ones look amazing Priya..I loved your insta pic so much..very beautiful! Ooh...this sounds so good, Priya. Roasted berries are inviting and good to know you liked it as well. Thanks for the mention and toast with roasted strawberries sounds yum!! Wat a beautiful and catchy roasted strawberries, just cant my eyes from ur clicks. Those strawberries looks so beautifully roasted. Wonderful recipe and so tempting! The first photo looks straight from a glossy cookbook Priya. Roasted strawberries sound delicious. Such a pretty way to make strawberries!! I loved all the pictures in this post. liked the idea of roasting strawberries ! yum.. Awesome idea to store the berries in hands.